When looking at the Streamlined Auditing and Monitoring of Community Based Services website, you may notice it is divided into columns/sections. Bread crumb navigation this tells you which site you are currently in within the Govenor's SharePoint sites. Use this to quickly jump back to pages or other areas within your site. Help button - can use it to search onhow to use SharePoint. Title for the site you are currently looking at. Search area. You may limit your search to only the Streamlined Auditing Site or all sites you have access to. Main Content area - contains the Mission or Charge of the committee, a list of Announcements and Calendar dates. Please do not add Links, if you have a link suggestion, please contact Jim Hobbs or Jamie McCoy. Report Countdown to the report deadline. View All Site Content - Shows a linear view of all the main site content. Shared Documents - Shows the list of Documents posted for this site. Team Discussion - a blog area for your team discussions. Sites - contains a list of sub-committee sites for your team. Post sub-committee specific information under these areas. People and Groups - a list of members that have access to the Streamlined Auditing website. 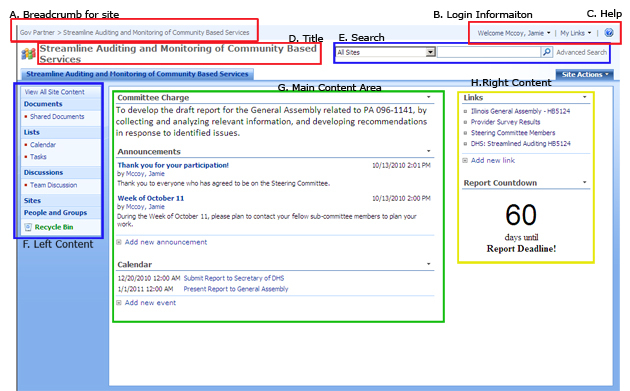 To gain access to the Committee Collaborative (SharePoint) Website, contact Millie Releford. If you have problems logging into the Collaborative website, the DoIT Service Desk at (217) 524-3648 V, (312) 814-3648 V, (866) 277-5669 TTY .